SPONGEBOB SQUAREPANTS: The New Musical leads the Outer Critics Circle nominations list with 11 nominations! Congratulations to SPONGEBOB SQUAREPANTS: The New Musical which leads the Outer Critics Circle nominations list with 11 nominations! Read the full story on BroadwayWorld.com here. 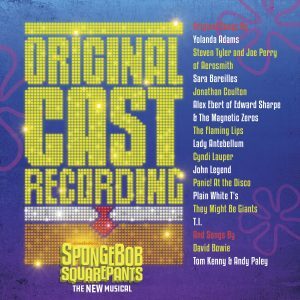 The Original Cast Recording of SpongeBob SquarePants – The New Musical is out now! The album features a score of original songs unlike anything Broadway has ever heard and is produced by Scott Riesett and Tom Kitt, with executive producers Scott Farthing, Doug Cohn and Susan Vargo. Check out the yellow 2-LP vinyl here! Click here to download or stream the album.